Music Flashcards – Need a Flyswatter? Music Flashcards are Fun. All You Need is a Flyswatter! Have you ever wondered where some teachers get all their great ideas from? Sharing ideas is how I learned about Music Flashcards and Flyswatters. What do they have in common that makes learning Music Flashcards SO much fun? At Ultimate Music Theory we are all about SHARING! I have learned so much from other teachers that I want to invite you to share your greatest teaching stories and ideas with us so we can all benefit from your experience and your brilliance :). 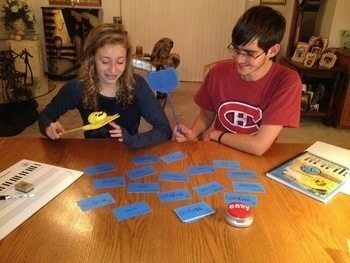 This cute idea is about Music Flashcards and a Flyswatter - your students will love it. Many years ago I had the privilege of meeting one of the most compassionate, caring and SHARING teachers that I have ever met. Her name... Shelagh McKibbon-U'Ren. Shelagh shared so many of her ideas with me that we became a writing team. We share the same Desire, Determination and Dedication to creating a community for music teachers to be able to learn how to teach more effectively. And we love to share creative ideas on how to motivate and inspire students and show them the Way to Score Success! Do your student’s parents ever ask how they can help the student review for a Theory Test or Examination, or how they can help the student “practice” theory? Grab your Flashcards! 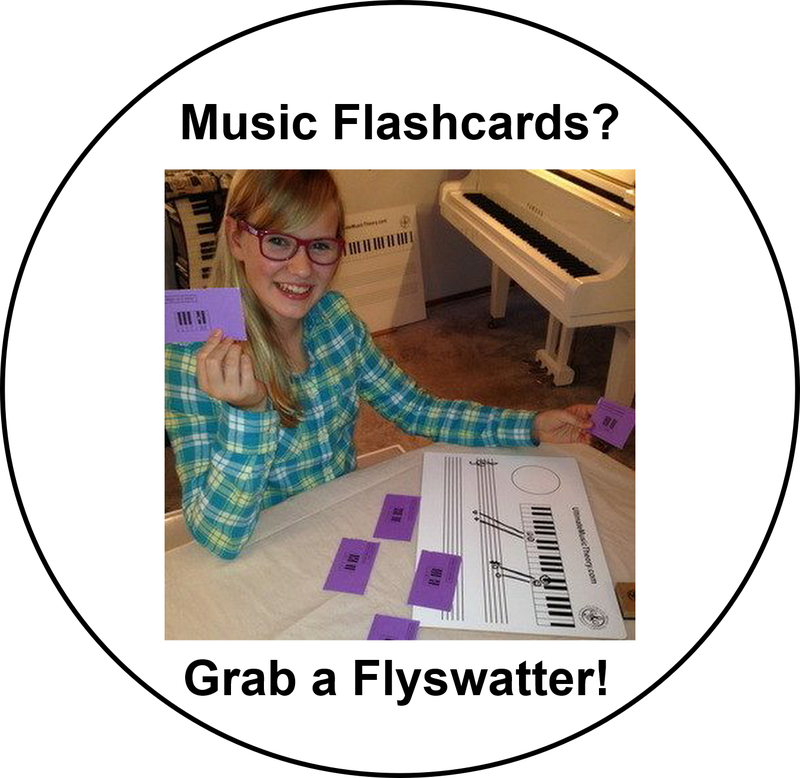 Even a “non-musical person” can support a student using the Ultimate Music Theory Flashcards. If they are worried about pronunciation, our new Ultimate Music Theory App contains pronunciations of Italian terms! Have you ever finished a lesson only to discover that you have a few minutes left? Grab your Flashcards and play a game! This will guarantee that your student will leave their lesson with a huge smile on their face! Music Flashcards are Fun. Here's Flyswatter SLAP! Flyswatters are awesome. They can be used to get rid of nasty flying (or crawling) critters that invade your teaching space. They can be used to create a small breeze if the air conditioner dies. They can also be used to study for your student’s Theory Examination. Whether working one on one in a private Theory Lesson or in a Theory Group, nothing perks up a lesson faster than bringing out the Flyswatters and the Music Flashcards! 1. Give each student a Flyswatter (and a warning to not slap anything but the Music Flashcards with them). 2. Spread out a dozen or so Music Flashcards on the table. They can be concept specific (for example, all the Staff Notes or all the Key Signatures) OR they can just be random Flashcards. 3. Ask the students to “Slap the Flashcard that…”. This game can be competitive: First Student to slap the correct Flashcard gets to “keep” the Flashcard and replace it with another Flashcard from the deck. At the end of the Game, the person with the most Flashcards “wins”. This game can be reward-based: First Student to slap the correct Flashcard gets a “treat” – have a bowl of cheerios or raisins or pretzel sticks as the “treat” (you can also get gluten-free treats at your local bulk store). This game can be EASY: First Student to slap the correct Flashcard gets to also slap the “Easy” Button. This game can also be non-competitive: Everyone just gets a “cheer” when they slap the correct Flashcard. Flashcards can stay on the table or, when correctly “slapped”, they can be put at the bottom of the deck and a new Flashcard can replace it. As your students get faster, make the questions harder. Instead of saying “Slap the Flashcard that shows the Key Signature of G Major”, say “Slap the Flashcard that shows the Key Signature of the Major Key with D as the Dominant Note”. You can also invite your Theory Students to a “Slap Party”. All Learning Styles – Visual, Auditory, Kinesthetic and Special Needs – will benefit from playing Slap. Ask each parent to provide a treat for sharing – you will provide the Flyswatters. 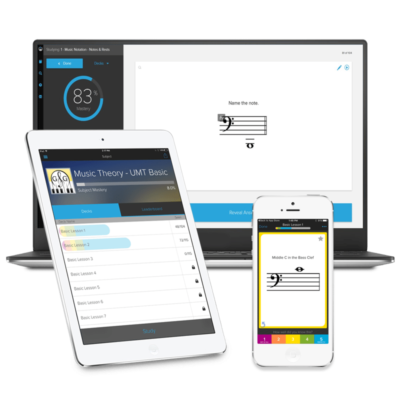 Remember to get your Ultimate Music Theory App for use with all the Ultimate Music Theory Workbooks, from Prep 1 to Advanced Rudiments (and for the Complete Workbook).